Have You Tried This Fun Halloween Concoction from Hershey’s? Every year, Halloween enthusiasts search for new and unique candy to give away on fright night. While traditional candy and chocolate is sure to please, Trick-or-Treaters are always welcome to some surprises! We have plenty of unique Halloween candy to keep your visitors happy at Blair Candy, including Hershey’s Candy Corn candy bars. Last year, Hershey’s released this fun new concoction consisting of white chocolate and candy corn bits – and earlier this week, we took a test in our warehouse to see just how our employees’ taste buds responded. We found that eleven of our employees loved the candy corn/white chocolate combination, while four others said they’d prefer to stick to traditional favorites, like Reese’s and KitKats. 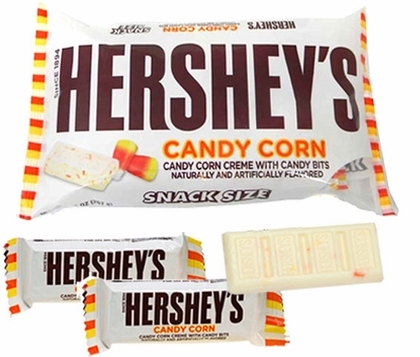 How will your Trick-or-Treaters respond to Hershey’s Candy Corn candy bars? Stock up on these (and the historic favorites) at BlairCandy.com. September 13th is National Peanut Day, and there are countless sweets and snacks to celebrate with at Blair Candy. Peanuts have become an American staple – They’re eaten at American sporting events like baseball, chopped up as ice cream toppings, and even yield the beloved spread, peanut butter! Peanuts are the #1 snack nut consumed in America, but they’re actually nut a not at all – technically, they’re legumes (simple dry fruits in the same family as beans). But don’t let this stop you from celebrating! PayDay Snack Bites: New from The Hershey Company are PayDay Snack Bites! Featuring a concentration of crunchy peanuts in every bite, these bite-size treats are perfect for on-the-go snacking. Enjoy these peanut and caramel clusters in a portion-controlled, 2.5-ounce pack. Snickers Peanut Butter Squared: If you’re a peanut-lover, there’s no doubt you’ll love indulging in these squares packed with peanuts, peanut butter, caramel, and nougat covered in milk chocolate. They’re just like the classic candy bars, only with peanut butter to thrill the peanut enthusiasts! Goldenberg’s Peanut Chews: These classic candies include dark chocolate and delicious, roasted peanuts. The snack size peanut chocolate bars have been around for decades, and continue to please peanut lovers everywhere. Peanut Jumbo Candy: If you love peanut brittle, you’ll love these nutty snack-size candy bars. They’re not just for the circus! 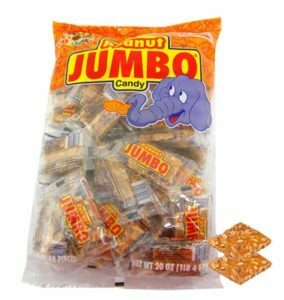 Prepare for Halloween with Gross Halloween Candy! 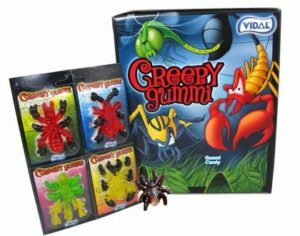 Creepy Gummi Candy: Enjoy delicious fruit gummies in the form of creepy, crawly bugs. With an assortment of gummy bugs like spiders, centipedes and scorpions, you’ll be sure to send the squeamish screaming! Gummi Body Parts: These gummies will create a morgue in your mouth! Terrify your guests by leaving out a bowl of these gruesome gummy body parts in the shapes of brains, teeth, bones, feet, and more. They’re not just for the zombies – but a bag of these would be a great addition to a zombie costume! Gummi Paint Tongue Bugs: Nothing will repulse your guests like a bowl full of gummy bugs! These creepy insects contain a center full of blue goo that paints your tongue, making them a hit with the kids. If gummy bugs and body parts aren’t enough, browse the rest of our creepy, gross Halloween candy at BlairCandy.com. You’ll be sure to disgust all of your ghoulish guests!